With the warm weather we're experiencing in Chicago many people are thinking of those first wonderful days of pleasant weather ahead. As I write this the signs of spring are already popping up all over the city; kids are riding their bikes, heavy winter coats are not being used, the neighbors are working on their cars (treating me to their favorite music at full blast) and the snow is melting. The melting snow is probably what most people look forward to, but not me. Sure I love spring as much as the next gardener and I can't wait for all the new gardening adventures that this growing season will bring but snow hides the urban ugly. The urban ugly is the dirty streets, the cracked or crumbling sidewalks accented by the black spots left behind by chewing gum and of course the litter that's so quintessentially urban. 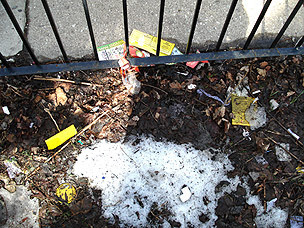 Now that the snow is pretty much gone I'm amazed by how much garbage there is in my garden, it's as if it snowed garbage throughout the winter. All of this wasn't there in the fall when I last cleaned my garden- it just magically appeared beneath the snow. "Do they ever find any of these missing kids? Probably not since these flyers never seem to make it inside of the mailbox." "How many different flavors of Doritos can the snack food market sustain? When I was a kid we had two flavors; regular and Ranch." "Are coffee cups the new cigarette butts?" "I wonder if this lawyer will help me sue Domino's Pizza for dumping all of these flyers in my garden." "If you think about it Little Debbie looks kinda creepy. " "I should keep this one, I'll may need a chiropractor after all of this ." Those were the only thoughts that were fit to post on a family friendly gardening blog. While everyone else was busy enjoying the nice spring weather I spent the day picking up garbage and wishing the snow would return. At least with a snow covered garden I could pretend like the garden didn't need cleaning and it wouldn't have dawned on me that with the return of kids on bikes, neighbors working on cars, winter coat storing comes the return of the urban ugly. I feel your pain. Why can't we be more like the European cities where it's a criminal act to litter ? Do those people who litter ever consider who's going to clean up their garbage, or don't they even think at all ? I not only clean my front yard, I go up and down the street collecting bags of garbage left over the winter because I just can't stand to look at it. Is man the only mammal that does this ? Shame, shame, shame on us. Hey props for the plug in the Sunday Tribune, that's a pretty sweet endorsement! Btw this is Jason Carol's son. Fyi if you ever wanna get rid of that bar blogspot puts on the top of your blog, just put a noembed tag surrounding the body tag on your site...just a small sneaktip. You're a better person than I am for cleaning up all that garbage. And yeah I think we are the only animals that do it. I've thought about removing it and have seen some hacks for it but I'm probably one of the few people who uses that nav bar to go around to blogs and when a blog doesn't have it it's kind of annoying for me. But I've seen a script that allows you to "hide" it with a solid color and the navbar shows up when you hover the mouse over it so I may do that. To the right of the house is this rocky road that leads to private property. Sometimes people hang out at the gate and lots of trash end up being tossed there, especially tossed into the woods between the property and road. It's impossible to get in there and clean it up because the trees are packed together yet you can still see annoying trash such as coffee cans and soda bottles.